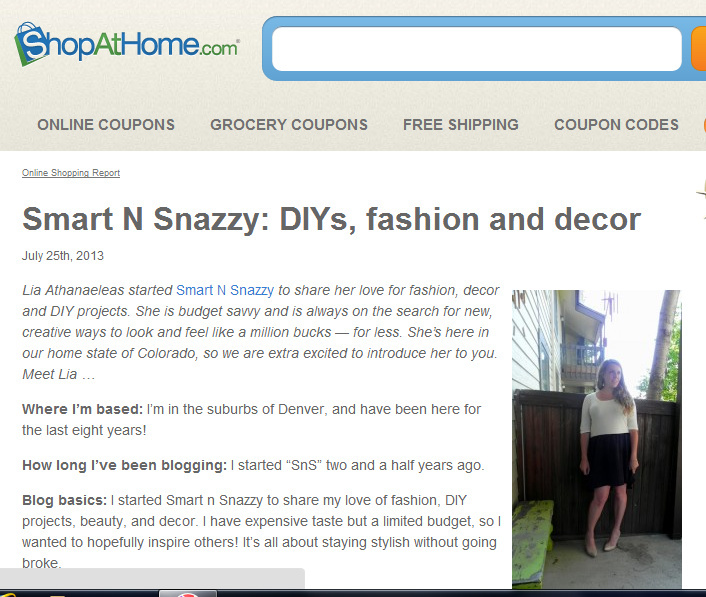 Smart n Snazzy: Learn More About SnS on ShopAtHome! Hi lovelies! I'm thrilled to be featured over on ShopAtHome today! They're a new-to-me company that is coincidentally located here in Denver. Love to save money while you shop online? Then make sure to check them out! Not only does ShopAtHome have amazing coupons and deals, but it also provides cash back for purchases you make through participating retailers! And not just some retailers, they've got all my faves like Nordstrom, Sephora, Ulta, Target, New York & Company, Old Navy, and pretty much any where else you can think of! Membership is free, all you have to do is sign up and find stores you want to save at! Easy peasy right? So head on over and check out my interview over on ShopAtHome, learn some more about yours truly, and spread some love!